About time Hydro Flask comes up with a wine bottle! Not that my regular old Hydro Flask water bottle didn’t work well for keeping wine chilled for hours, but the new Hydro Flask Wine Bottle is perfectly designed to fit an ENTIRE bottle of wine. 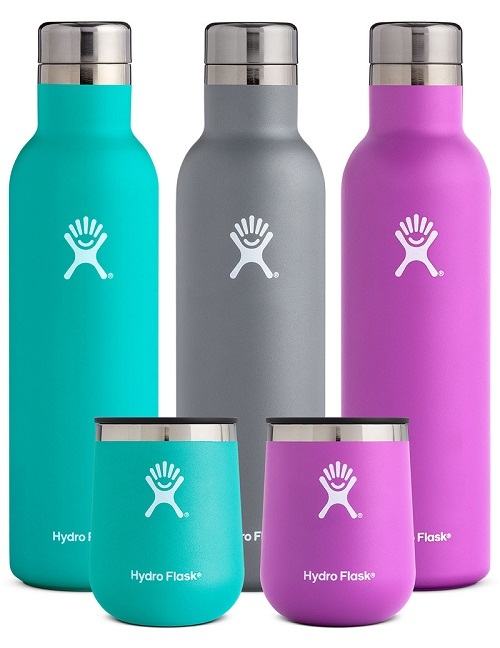 The sleek and stainless Hydro Flask Wine Bottle pairs adorably with matching 10 ounce tumblers. A cleverly designed Pure Pour opening ensures you don’t drip any precious vino in the dirt and a leakproof cap let’s you take your favorite vintage on any adventure. Made from super high-grade stainless steel, the bottle won’t retain any flavors meaning tonight’s white won’t be muddled with any flavors from last week’s red. Such a fantastic gift idea for wine loving outdoor types, hint hint I want one in all the colors!